Dorm Co. Tip: Add some fun to your laundry routine! A dorm laundry bag is a basic dorm necessities item you can't go to college without. While this is a basic college supply, that doesn't mean that it has to be boring. In fact, since this is a basic dorm item and it's a task that isn't all that fun, that's the perfect reason why this dorm essentials item should be fun and colorful. For a better dorm laundry routine, add our Capri Chevron - College Laundry Bag. Our Capri Chevron - College Laundry Bag has a multi-colored Chevron print that will add to your dorm room decor while it's sitting out in your college dorm room. While this dorm supplies item has a trendy, bright style that will add to your dorm room decor, it is also functional. 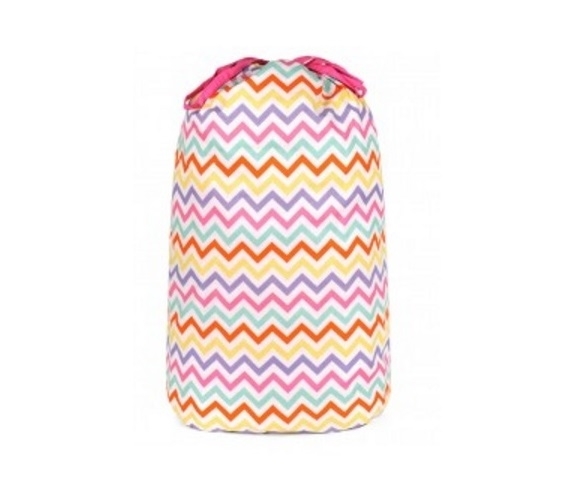 Our Capri Chevron - College Laundry Bag is lined with cotton fabric and has a drawstring at the top. This drawstring is essential - after all, you don't want your laundry falling out of your dorm laundry bag and onto the floor or leave a trail of socks behind you as you walk down the hall. Make your dorm laundry routine a little better with our Capri Chevron - College Laundry Bag.